44-acre lake provides a warmwater fishery for largemouth bass, bluegill, channel catfish, and northern pike. Trout are also stocked once in February and bi-weekly March through May. Night fishing allowed. The house sits right off the Public Access giving a short walking distance to the lake. The house is equipped with internet and a television. It also has a kitchen and a dining room. One room has a bunk bed, another bedroom has a twin bed and in the main room there's a queen bed. The bathroom has a working shower and toilet. The sun room has fireplace capable of burning logs, sauna & plenty of room for guest. You'll enjoy your odyssey here for sure. We have been small business owners for over 15 years. We own and operate two small businesses, we have been pubic servants of our community. We love to serve others and we love our Wild & Wonderful state, it gives us pleasure to help others enjoy the place we hold dearest. This property has a lot to offer. Holiday gatherings with specified seating and table arrangement are possible. Perfect for small retreats. Fishing poles and fishing gear are available for all ages. A gas grill, charcoal grill and a fire pit is provided for outdoor grilling and cooking alike. Hot tub for relaxing a evening under the beautiful night sky, free of light pollution. Being in the middle of nature gives you a peace of mind, listening to the birds sing and enjoying the wonderful view. Indoor infrared sauna to detox and remove stress. Two kayaks are available upon request with life jackets. 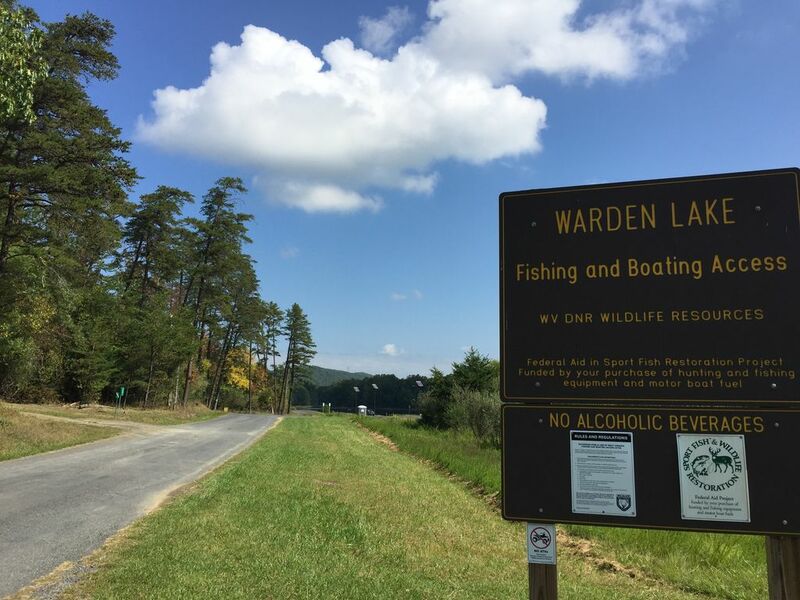 Warden Lake is within a short walking distance from the house. Extremely vast and scenic lake, complete with a boat access ramp and a dock. Sun room with a fireplace than can be used. An infrared sauna is located inside. Hot tub situated on the front upper deck. Good place to go mountain biking. Lots of roads, suitable for walking or jogging. A lake that's frequently stocked with fish. Campfire to gather around in the evenings. Pet friendly. Please bring ice if desired. Some ice provided on site. Variety of sweeteners, powered coffee creamers, spices, loose teas, coffee and cooking oils. Plenty of dishes, bowls, utensils, glass wear provided. Baking dishes, cookies sheets, cupcake pans, crock pot all provided. Cast iron dutch oven and cast iron pans for outdoor use provided. Kitchen dining seating 6. Upon special request tables and chairs can be provided up to 25 in sun room area. Variety of book and magazines. Corn hole boards with bags, dart boards, volley ball, basket ball net. Large Open Area for Tents, Hammocks, etc. 2 Kayaks available upon request. Two Deck areas. Upper deck with gas grill and hot tub. Lower deck with tables, chairs, lounge chairs. Bird watching, star gazing, nature walk, great location to take family photos, camping, campfires, depending on frigid temperatures possibility of ice fishing. This adorable little house at the lake was perfect. The location feels secluded but it’s still close enough to restaurants, the market and gas station. The house itself is very homey, inviting and comfortable and is well stocked with anything you could want. The hot tub and sauna are a lovely added bonus. Paula is a wonderful host and is very friendly and informative. We’re looking forward to staying here again sometime! Paula is a really friendly host. I and my friends loved this location so much that we can't wait to go back there again. The hot tub was amazing. Best location for people who love star gazing. Overall we really had a memorable weekend at this place. So pretty and feels like home! Awesome weekend getaway! Very cozy and loved the personal touches done by Paula! Also she baked us cookies which was a nice and warming welcoming! The lake is a 2 minute walk right down the driveway with all the fishing you could dream of! The hot tub and firepit were perfect for the chilly nights! We can’t wait to come back again! We had an excellent time at Paula’s lake house! The lake is close & convenient & the house is fully-stocked & very comfortable. Paula has thought about everything & has made her lake house a cozy & relaxing spot, with tons of thoughtful touches. We cooked several meals in the kitchen & had every tool we needed. The beds are comfortable & the bathroom has all that you need. The hot tub, outdoor fire pit, kayaks, infrared sauna & indoor fireplace puts this spot over the top! We enjoyed using it all & were sad to have to leave. Thank you for having such a wonderful, yet affordable place for us to celebrate our daughter’s 15th birthday with her friends. We all had a blast & have not one complaint...we even had good weather! My husband & I hope to stay again in the future for a romantic getaway. This was the perfect get away for a work weary couple. Highly recommend for a little RnR. Very nice house and lot with many awesome amenities! Very cozy home with beautiful woods surrounding. The lake is very close-by (2 minutes walking distance). The hot tub and sauna are very nice. Perfect place to come and zone out from the rest of the world and everyday life. Everything was spectacular and will definitely recommend to others and will definitely consider staying next time if available. Thank you again!